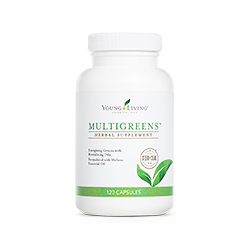 MultiGreens™ is a nutritious chlorophyll formula designed to boost vitality by working with the glandular, nervous, and circulatory systems. 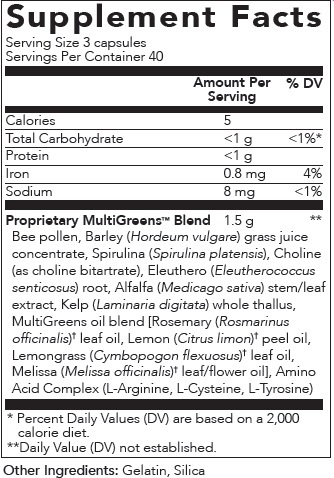 * MultiGreens is made with spirulina, alfalfa sprouts, barley grass, bee pollen, eleuthero, Pacific kelp, and therapeutic-grade essential oils. If you have a slow metabolism, take 3 capsules two times daily. If you have a fast metabolism, take 4 capsules once or twice daily. Best taken 1 hour before meals. For stomach sensitivity, take with meals. Keep in a cool dry place. Do not expose to excessive heat or direct sunlight. If pregnant or under a doctor's care, consult your physician.